The argument has often been made that the left is so weak that any foreign policy stance it takes is mostly irrelevant in any case. Yet, in the last few years, with the rise of left groups like the Democratic Socialists of America with some degree of influence on American politics, a future in which leftist debates over far-flung countries might have actual consequences has become less difficult to imagine.2 These debates about moral responsibility are not merely philosophical but also empirical questions. The correct diagnosis requires an accurate understanding of the situation to be resolved. Such an understanding of Syria is unquestionably absent on the left today. It is true that the Syrian situation is incredibly complex. The degree of temporal and geographical variation of the war impedes clear assessment of the conflict’s most relevant events and actors. Syria in the last eight years has contained multiple uprisings and multiple subconflicts that have created a pile of information for observers to sift through. Of course, one obvious challenge is that of separating fact from fiction in a war reported largely via smuggled videos, second-hand recounting, and citizen journalists. Yet beyond this, the media must undertake the task of distilling this heap of facts into a coherent analysis—understanding which events constitute game changers and which are minor side stories. All this in a country that, prior to the 2011 uprising, was of almost no interest to most Americans, who only have the barest knowledge of the historical, political, and social context of the region, especially beyond its intersection with U.S. affairs. The difficulty of this undertaking is a major reason why it is possible for two people, each basing their analysis on well-established facts, to arrive at such wildly differing narratives. The Syrian conflict can be described as having passed through five stages. Of course, these stages generally don’t have clear-cut turning points. They overlap, in part due to the wide geographical variation in how the war’s dynamics have unfolded. In the coastal areas around Latakia and Tartous, where Alawites are concentrated, the regime has managed to hold a relatively firm grip on power throughout the conflict, although not without challenges. Syria’s major cities—Aleppo, Hama, Homs, and Damascus—running like an urban spine down the non-coastal Western region of Syria from the Turkish to the Lebanese borders, have wavered between being held by various militias and the regime. Eastern Syria, where the relatively less dense population clusters around the fertile agricultural strips and bodies of water breaking up the otherwise arid desert landscape, has seen fierce fighting in the second half of the conflict because of the strategic importance of its oil and wheat fields, its shared border with Iraq, and its concentration of Kurdish populations. The first stage of the Syrian conflict was dominated by the grassroots uprising sparked in February 2011 in the small southern city of Deraa. It began when the regime arrested and brutally tortured schoolboys who had graffitied anti-regime slogans on a wall. Public outrage grew when police fired live rounds into the crowds of the boys’ families. Demonstrations erupted across the country, led by the smaller urban centers of marginalized rural provinces and later by the large (but also marginalized) city of Homs. The brutal tactics used by security forces against peaceful protesters swayed many people from soft support or timid neutrality to open anger at the regime. ISIS’ emergence onto the world stage would give birth to the fourth stage of Syria’s tragedy. In 2014, the capture of Mosul dominated international news headlines, with the group seemingly (for those who had not been following Syria) coming out of nowhere. In September, Obama announced the beginning of an open-ended campaign of airstrikes in Iraq and eastern Syria against ISIS and the obscure “Khorasan” group.5 While Russia had supported the Assad regime with military and political aid from the beginning of the conflict, in September 2015 it undertook a full-scale intervention alongside an Iranian-led ground offensive, granting Syria’s civil war the dubious distinction of being the first conflict Russia had fought outside of the borders of the former USSR since its fall.6 While this constituted a major turn for the geopolitics of the conflict, for many of those on the ground in Syria, the professional airstrikes of these major powers were not a terribly dissimilar experience from the barrel bombs dropped by the regime for the previous years. In 2017, the three-year blitz by the United States and the Syrian Democratic Forces, their Kurdish-led on-the-ground proxy force, finally brought ISIS completely to its knees. The Russian-Iranian surge, along with the latitude given to Assad to not have to deal with ISIS, all but sealed Assad’s victory over the other rebel militias. A sixth stage is now emerging, that of the final negotiations over the terms of the victory, for which some questions still remain unanswered: What happens to the Kurds in a postwar Assadist Syria? What happens to the millions of refugees stranded abroad by this brutal conflict? And what will United States postwar policy toward Syria look like? The nature, depth, and goals of U.S. involvement in Syria have been a huge source of confusion on the U.S. left and elsewhere. As with other confusions around the conflict, these are based on a misunderstanding of the relative importance of a variety of programs of intervention and how they have changed over time. From amidst the noise, we can draw out a signal of broad trends in Washington’s orientation. From the perspective of the U.S. foreign-policy establishment, Syria and the Arab Spring have essentially offered a range of possible outcomes, none of which are ideal. It is true that the United States has a historically cold relationship with the Assad regime.7 Yet this did not mean that the uprising was viewed as an unambiguously clear chance for the United States to oust him. The most fitting interpretation of the many contradictory statements and leaked policy documents regarding Syria indicates that the various branches and institutions tasked with developing foreign policy and military strategy were wracked by debate over “the autocrats you know or the Islamic extremists you fear.”8 The United States saw itself presented with a set of unpalatable solutions, among which it attempted to navigate toward those that offered the highest chance of survival for its client regimes in the Middle East and the least direct threat to its interests. This meant that while Washington, at periods, hoped to weaken Assad, it always remained skeptical of a full takeover by the much less-known popular revolutionary movements or militia groups that organized themselves in Syria in the last eight years. The Obama administration’s ambiguity on challenging Assad too aggressively was well-illustrated in the August 2013 decision not to attack the regime after the Syrian military crossed Obama’s stated “red line” by gassing hundreds of civilians in a Damascus suburb. While many worried that a U.S. attack seemed likely, Obama chose to seek congressional approval. This stalling created space for Russia to offer a deal to dismantle Syria’s chemical weapons program, allowing the United States to save face on not following through on its threat.9 While some attributed this to protests, in fact, demonstrations against the airstrikes were small and not very well-organized. The decision not to strike came from within the government itself and was unlikely influenced by the minor public outcries where they occurred. The broad orientation being stated, understanding the twists and turns of how the United States sought to pursue this vision requires a closer examination of the changes over time. Military intervention into Syria has taken place in large part via three large distinctive programs, which changed in relative importance as Washington responded to changes on the ground. In rough chronological order, first was the State Department’s provision of nonlethal weaponry to the FSA; second, the covert CIA training program Timber Sycamore; and third, Operation Inherent Resolve, the Pentagon’s formation of the anti-ISIS coalition in alliance with the Kurdish People’s Protection Units, the YPG, in Syria. I will also discuss, to a lesser degree, the role of U.S. regional allies. These supplies were enough to give the militarized opposition hope for larger infusions of resources later but fell far short of anything that could overthrow the regime. Essentially, the supplies maintained the momentum of the war, leaving each side to be just weak enough to neither win nor lose. As the second year of the Arab Spring crept to a close, Syria did not seem to offer up any of the resolutions11 that had been reached by that time in other Arab Spring countries, such as the geopolitical negotiations that led to transition in Yemen, the holding of Egypt’s first legitimate elections in half a century, or the capture and killing of Qaddafi in Libya. Instead, Hezbollah’s definitive entrance into the war in 2012 on Assad’s side, and escalating Iranian and Russian involvement, served to bolster the Syrian regime’s lagging fortunes and further prolong the fighting. But the opposition’s military capacities were also reinforced at the same time by a kaleidoscope of militia groups that gradually eclipsed the FSA. These groups, with their alliances and splits shifting with each turn on the battlefield, ranged from secular and nationalist to Islamist, with the latter growing ascendant. The program to supply the FSA was eventually suspended in December 2013 when shipments were seized by the Islamic Front.12 In any case, by that point the Obama administration had turned its focus to other ways for dealing with the unfolding conflict in Syria. Yet the new administration remained wary of repeating the mistakes of the occupation of Iraq. Many attributed the major failure there to the total destruction of the country’s government institutions. The administration did not want to risk any of the newly emergent militias simply taking power. Instead, the administration hoped that with a moderate strengthening of the rebels with whom it had relations, Assad could be persuaded to undertake a Yemen-style deal: a gentle transition of the head of state while leaving most of the governing institutions in place, guided by local and international powers. This fine balancing act was destined to fail. Of course, many others besides the United States administration had a stake in building client networks among rebels in Syria. The Americans were trying to add just the right amount of salt to a stew that had ten other cooks. And as money flowed in from other countries, groups, and individuals around the world, maintaining influence and discipline over any particular group only grew more complicated. While both the CIA program and the Pentagon train-and-equip efforts fizzled out, another experiment in how the United States would weigh in on the Syrian outcome would prove more enduring, and its beginnings constitute a major turning point of the Syrian civil war overall. This program, like the train-and-equip program, was not focused on fighting Bashar al-Assad, Iran, or Russia, but in taking out ISIS. However, in this case, Washington’s chosen proxy fighters on the ground were more effective, perhaps because for them also it was the fight against ISIS, rather than Assad, that was their own urgent concern. ISIS’ origins and continued presence in Iraq, coupled with their insistence on relative financial independence—preferring oil smuggling and extortion to begging wealthy foreign funders for money—meant that their expansion into Syria began from the Iraq border into the country’s concentration of oil fields in the northeast. ISIS’ push into northeast Syria had brought them into intense conflict with the YPG, the Kurdish militia affiliated with the PKK, the Kurdistan Workers Party, which had long challenged the government of Turkey. The YPG had in previous years wrested control of Syria’s majority Kurdish areas from the Assad regime. Since the uprising, they had also established a unified military and political dominance in what had previously been a more heterogeneous Kurdish political landscape. When Washington first announced an open-ended military campaign against ISIS in September 2014, it saw eastern Syria’s Kurdish regions as a tangential concern to the majority Sunni Arab regions captured by ISIS, such as Raqqa and Deir Ezzor. While the foreign policy establishment’s main insight from the failures of Iraq is that destroying governing institutions to overthrow a dictator may do more harm than good, one wonders if a future lesson from Syria may be that the indiscriminate razing of cities to save them from occupation by a tyrannical jihadist group is rather counterproductive as well. By virtually every metric, the intervention against ISIS has been the major intervention of the United States in Syria. If we can use dollars as a proxy, the FSA provisions amounted to a few hundreds of millions of dollars in cumulative costs, and the CIA program came to $1 billion. The failed anti-ISIS effort, the train-and-equip program coupled with the eastern Syria airstrikes campaign, completely eclipses the costs of all of the other programs summed, clocking in at well over $14 billion in spending (and still rising). And yet, what the average American has in mind when discussing (whether criticizing or praising) “United States intervention in Syria” remains myopically limited to intervention against Bashar al-Assad. This can be illustrated in a number of ways. For example, Google Trends, which provides a metric for analyzing the volume of search queries over periods of time, shows that searches for “United States intervention in Syria” show distinctive peaks around April 2017 and 2018—not around the times when United States announced new escalations of the anti-ISIS coalition or when air strikes reached their peak, but when the United States threatened to strike assets held by Bashar al-Assad. Similarly, while some protests have taken place whenever the United States has proposed airstrikes against assets belonging to Assad, there have been virtually no protests against the United States anti-ISIS airstrikes in either Iraq or Syria. The reason we have diverged so far from the actual facts of U.S. involvement appears to be overdetermined by a number of overlapping factors. It seems as if many of us have an overly narrow conception of the form U.S. imperialism should be expected to take—that Washington should be expected to intervene primarily for the purpose of regime change and not against non-state actors found in a given country. Of course, many U.S. interventions do have the goal of regime change. But the rise of non-state groups engaged in asymmetrical warfare against the United States has led to the rise of military involvement against non-state targets in Afghanistan, Colombia, Sudan, Iraq, Lebanon, Yemen, Somalia, Pakistan, and elsewhere. The shift to this type of warfare aligns with the “jihadist threat” of small militia groups replacing the threat of Communism, which was largely represented by USSR-aligned governments. Massive and prolonged bombing campaigns against militia groups shouldn’t be unexpected, yet they still seem to go much less noticed than do similar actions against governments, even if they are just as fatal, morally dubious, and costly. Second, some faulty analysis results from falsely assuming an identity between the goals of U.S. allies and of the U.S. policy establishment itself. Washington of course deserves criticism for the many immoral actions taken by countries to which it provides weaponry and support. Yet it is an analytical overstep to claim that the entirety of these countries’ actions simply represent Washington’s true intentions that the U.S. is unable to carry out on its own because of PR optics. It should be clear by now from the public and heated fights between U.S. allies like Saudi Arabia and Qatar or Canada, as well as the U.S. funding for a group affiliated with the PKK, longtime bugbear of the Turkish government, that allies held together by a bundle of shared goals may still at times find themselves with different interests and different strategic perspectives that may lead them to act not in coordination, but at odds with one another. Even the often lumped-together “Gulf Arab countries” have had a range of policy orientations toward Syria. This is not to excuse the immorality of alliances of convenience with bad actors, but rather to point out that a theory of allies’ perfectly homogenous interests across the board tends to obscure more than it clarifies. Some might point to another argument: If we misunderstood the American intervention, it is because the American media seek to hide the truth about Syria because of their single-minded focus on smear. This is a peculiar explanation. For all their faults, mainstream U.S outlets like the New York Times and Washington Post have done extensive reporting on the anti-ISIS coalition, including some admirable investigative work revealing both the human toll and the undercounting of deaths in U.S. reports.25 U.S. officials have publicly spoken with journalists about Operation Inherent Resolve and its deep military involvement in eastern Syria, including regularly with outlets like the BBC. Airwars, a transparency project based at the University of London, has done a great journalistic service by providing independent and well-verified assessments of international military actions in Iraq, Syria, and Libya. Raqqa Is Being Slaughtered Silently26 has reported extensively on the “war of annihilation” committed by the U.S. bombing campaign. It is not the primary-source journalists who have failed to undertake their fourth-estate duties. Rather, in this case many leftist writers on Syria resemble those who scour the obscure corners of the Internet for evidence of the New World Order, while sufficient evidence of the unprecedented power of society’s “cabal” of CEOs and Senators gets reported in the news every day. While latching onto every occurrence27 that supports the thesis that the United States has been on a single-minded and undifferentiated campaign from day one to take Assad out of power at whatever cost, they ignore the many other facts working against their thesis. All of these facts are true of course; they aren’t pulled out of thin air. But through their list-like juxtaposition, they present a picture of the American intervention that seems to imply the anti-ISIS intervention is a minor side-project to the primary goal of overthrowing Assad via the backing of Islamist groups. In fact, the 2,000 troops acknowledged by the Pentagon in Syria are there supporting the U.S. coalition against ISIS, in cooperation with the SDF—a fairly important contextualization that gets obscured. As another example, Shupak is technically correct that the United States has bombed government forces in Syria “at least three times.” He refers to an article discussing three such attacks—the 2016 air raid in Deir Ezzor, Donald Trump’s airstrike against the government Shayrat airbase following the Khan Shaykun chemical attack, and the attack on government forces in the Al-Tanf deconfliction zone in May 2017. What is not mentioned is the fact that almost all the U.S. strikes against the Assad government occurred when its forces threatened to encroach on the SDF and were not part of any effort to topple the regime. Whether such analyses can be attributed to a genuinely naïve lack of knowledge or a concerted effort to present only a certain picture, they have contributed to the poor understanding on the left of the extensive U.S. involvement in Syria. While the debates over gas attacks, how to characterize the opposition, and the origins of ISIS continue to rage on, clear and informed discussion of the U.S. strategy of airstrikes against ISIS remains in short supply. The war in Syria is drawing to a close, and, for the near and medium term, the Assad regime looks to have won. Still, some questions about the postwar situation remain, most pressing among them the future of the Kurds and of the many Syrians who have left. Washington will have some influence on the final terms of the victory, though with the current administration in place, the left’s ability to shape these terms in the next few years will remain admittedly limited. The de facto Kurdish autonomous region in Syria is formally known as the Democratic Federation of Northern Syria but is still commonly known as Rojava. Social arrangements there have many positive aspects, including democratic structures and feminist practices. Yet, as Yasser Munif points out, there were also hundreds of other local councils practicing democratic governance in Arab-majority areas of Syria.32 The Rojava project was able to survive and thrive initially due largely to a strategic decision on the part of the Assad regime to withdraw its military forces from Kurdish-majority areas in July 2012, to free up troops for fighting elsewhere and to placate the historically rebellious Kurdish regions.33 This divide-and-conquer strategy worked, perhaps better than the regime could have imagined. Cooperation remained limited between Arab-majority and Kurdish-majority militias on major military offensives against the regime. The arrival of ISIS on the scene further exacerbated the split, as the group represented the primary existential threat to the Kurds in eastern Syria, while militias in the Arab-majority regions faced Assad and Russian airstrikes as a greater danger. In the short term, adhering to the terms of the regime’s divide-and-conquer strategy has been successful for the Kurds. But now, the regime looks poised to win the entire war. It is possible that the threat of YPG’s military capacities on their own could compel the regime to continue with some version of a pacification. But the Assad regime’s ability to tolerate a radical experiment in democracy anywhere in Syria, as it retains a tight authoritarian grip on the rest of the country, seems questionable at best. Such an arrangement will only become more difficult due to the neighborhood in which Rojava sits. As a reconsolidated Assad regime seeks to rebuild relations with its neighbors, who have already made their opposition to the Rojava project clear, it will also have a growing material interest in returning the Kurds to their pre-2011 status as fully dominated under a centralized regime. The Kurds’ territorial wins in the last several years are due in great part to their intensive four-year military alliance with the United States. While the YPG’s battlefield capabilities against ISIS were enough to attract the United States to recruit them as proxy fighters, their effectiveness against the Syrian, Russian, and Iranian militaries, freed up from fighting on other fronts, as well as from potential Turkish and Iraqi pressures at the borders, seem less sure. At the very least, it seems likely that some assurances of further U.S. backing are indeed required to garner Kurds the leverage needed to tip negotiations over potential Syrian federalism in their favor. For this reason, many leftists hope the United States stays in eastern Syria to protect the Kurds’ autonomous and democratic future. In an article in In These Times, Meredith Tax addresses many of the arguments used by the left to oppose interventionist policies, arguing that Washington should honor its military commitments to the Kurds to ensure the continuation of a progressive enclave faced with “jihadis and fascist states that want to destroy them.”34 Yet this is revealing of where the realpolitik strategy of the Rojava project becomes muddled. The United States faces a great deal of pressure from both the Iraqi government and its NATO ally Turkey to discourage the creation of any sort of Kurdish territory in the region. Both of these countries have engaged in decades-long campaigns to brutally suppress movements for Kurdish autonomy in their own countries. Essentially, the United States faces two mutually exclusive choices in Syria: abandoning the Kurds when it comes to holding up their tacit end of the bargain in the anti-ISIS coalition, or further antagonizing several of the region’s major poles of power by maintaining an expensive and dangerous military presence in northeast Syria until a deal favorable to the Kurds is achieved (if it is achieved at all). Yet, an example just across the border already provides grounds for the prediction that the Kurdish Democratic Union Party’s realpolitik may rely on an overly optimistic view of Washington’s commitment to establishing a Kurdish region. The Kurds in Iraq also served as U.S. proxies against ISIS, and following the success of that military campaign, Masoud Barzani, the president of the region of Iraqi Kurdistan, held a September 2017 referendum for statehood, with the confidence that Iraqi Kurds could reap the rewards of their U.S. alliance. In response, the Iraqi government sent troops into territories that had been held by Kurdish armed groups for three years and then expanded even further into Kurdish-held territories, seizing even the strategic Kirkuk oil fields, with the dual blessing of Iran and Turkey. In contrast to Barzani’s calculations, U.S. officials publicly scolded him for holding the referendum and sat on the sidelines as the oil fields were seized.36 Considering that so many of the same geopolitical conditions were in place in Iraq as now hold in Syria, no one should be especially surprised if the United States once again steps aside to let a central government roll over Kurdish territorial gains won with the help of U.S. weaponry, airstrikes, and training. Of course, the U.S. military establishment has no deep interest in ensuring human rights abroad—its alliance with the Kurds had nothing to do with the democratic nature of the Rojava project and everything to do with the Kurds seeing ISIS as the primary threat, whereas Arab militias were much more reluctant to turn their guns away from Assad to fight Washington’s war on ISIS. Seen from this view, relying on an alliance with the United States to mitigate potential rollbacks in autonomy under Assad’s reconsolidated Syria, with its two anti-Kurdish neighbors, seems more like a high stakes, risky gamble than shrewd realpolitik. What happens to the Syrians living outside the country once the final battles are fought? With increasing insistence, politicians in Damascus, Beirut, and Amman are claiming Syria is now a safe place for those refugees to return to. The Syrian state media have been posting photos and accounts of such returns as part of their victory lap. But there is good reason to believe that many refugees will never again live in their home country. First there is the obvious reason that at this point, some who left Syria have been living abroad for as long as seven years—enough time to find work, start a family, learn a new language, and lay down roots in a new place. Economic success abroad, for those who have found it, adds another obstacle to justifying return to a now war-ravaged country. In countries with a relatively straight-forward path to naturalization, achieving full citizenship provides yet another substantial tie to their new homes. In terms of refugees, the debate in the American left should be rather simple. In the face of continuing anti-refugee rhetoric, we should push to roll back the revised form of Trump’s Muslim ban, expand the quotas for accepting refugees to the United States from Syria and other unsafe countries, and fight for an extension of Temporary Protected Status for Syrians. Where this proposal becomes more controversial is in the understanding in the pro-refugee movement of what caused Syrians to become refugees in the first place. This relies in part on an understanding of why, for many Syrians, a Syria under Assad will never again feel like a home they can return to, and an acknowledgment of the destruction Assad has wrought on his own people. It also requires an acknowledgment that depictions painting all Syrians opposed to Assad as jihadis or jihadi-sympathizers serve as fuel to the fire driving Islamophobic anti-refugee attitudes on the right and center of the American political spectrum. Unfortunately, Syria is unlikely to be the last civil war of its kind. Authoritarianism and strife in the region remain in ample supply and may even be growing stronger. Yet the U.S. left is growing stronger too, and may have more sway over foreign policy in the future. A clearer understanding of what happened in Syria, where our collective blind spots were, and what went so wrong is essential if the left is to have a better grasp on future conflicts. Noam Chomsky, On Power and Ideology (Pluto Press, 1987), 51. Daniel Bessner, “What Does Alexandria Ocasio-Cortez Think About the South China Sea?” New York Times, September 17, 2018. Although of course, each group’s commitments to any of these principles might vary significantly. Aron Lund, “How Assad’s Enemies Gave Up on the Syrian Opposition,” The Century Foundation, Oct. 17, 2017. Dan Roberts and Spencer Ackerman, “Barack Obama authorizes air strikes against Isis militants in Syria,” The Guardian, Sept. 11, 2014; “Khorasan” was most likely a strange euphemism for Jabhat al-Nusra. See Kia Makarechi, “Did the government invent an ‘imminent threat’ to bolster support for war?” Vanity Fair, Sept. 29, 2014; Glenn Greenwald and Murtaza Hussain, “The Fake Terror Threat Used to Justify Bombing Syria,” The Intercept, Sept. 28, 2014. Maria Tsvetkova and Anton Zverev, “Ghost soldiers: the Russians secretly dying for the Kremlin in Syria,” Reuters, Nov. 3, 2016; Aron Lund, “Not Just Russia: The Iranian Surge in Syria,” The Carnegie Middle East Center, May 23, 2016. That being said, the absolute and uninterrupted chill of the relationship has been overstated by some contemporary commentators. It is easy to forget nowadays that before the Arab Spring an Obama-brokered agreement between Syria and Israel was seen as something that could be in the cards: Seymour Hersh, “Syria Calling,” The New Yorker. Syria was also cooperative in the initial years of Bush’s “War on Terror,” serving as one of the most common destinations for prisoners subjected to extraordinary rendition: Ian Cobain, “CIA rendition: more than a quarter of countries ‘offered covert support,’” Guardian, Feb. 5, 2013. William Burns, “American Strategy in a New Middle East,” Statement Before the Senate Committee on Foreign Relations, Mar. 17, 2011; Nafeez Mosaddeq Ahmed, “U.S. military document reveals how the West opposed a democratic Syria,” Le Monde diplomatique, Sept. 24, 2018. Jeffrey Goldberg, “The Obama Doctrine,” The Atlantic, Apr. 2016. “U.S. committed to providing non-lethal aid to Syria opposition,” The Telegraph, Apr. 21, 2013; Louisa Loveluck, “What’s non-lethal about aid to the Syrian opposition?” Foreign Policy, September 20, 2012, foreignpolicy.com/2012/09/20/whats-non-lethal-about-aid-to-the-syrian-opposition/; “United States and UK suspend non-lethal aid for Syrian rebels,” BBC News, Dec. 11, 2013. Which, of course, all proved to be fleeting in any case. Mark Landler, “U.S. Considers Resuming Nonlethal Aid to Syrian Opposition,” New York Times, Jan. 9, 2014. Eric Schmitt, “CIA Said to Aid in Steering Arms to Syrian Opposition,” New York Times, June 21, 2012; Nour Malas, “Syrian Rebels Get Missiles,” Wall Street Journal, Oct. 17, 2012. Aron Lund, “How Assad’s Enemies Gave Up”; C.J. Chivers and Eric Schmitt, “Arms Airlift to Syria Rebels Expands, With Aid from CIA,” New York Times, Mar. 24, 2013. Despite the persistent curiosity around the question of who funds ISIS, the answer appears to be mostly—itself. Most credible reporting points to the majority of ISIS funding coming from a combination of oil and antiquities-smuggling activities supplemented with taxation and theft from local populations in the areas it has conquered. Denver Nicks, “U.S. Forms Anti-ISIS Coalition at NATO Summit,” Time, Sept. 5, 2014. Paul McLeary, “The Pentagon Wasted $500 Million Training Syrian Rebels. It’s About to Try Again,” Foreign Policy, Mar. 18, 2018. Mark Mazzetti, Adam Goldman, and Michael S. Schmidt, “Behind the Sudden Death of a $1 Billion Secret CIA War in Syria,” New York Times, Aug. 2, 2017. Aron Lund, “Why the Victory in Kobane Matters,” Carnegie Middle East Center, Feb. 13, 2015. Aron Lund, “Origins of the Syrian Democratic Forces: A Primer,” Syria News Deeply, Jan. 22, 2016. Matthew Yglesias, “Donald Trump’s corruption means he’ll never be a ‘normal’ commander in chief,” Vox, Apr. 16, 2018; Marc Cher-Leparrain, “The UAE has it in for the Muslim Brotherhood,” The New Arab, Feb. 22, 2017; Wladimir van Wilgenburg, “Saudi Arabia to invest $100 million to SDF-held northeastern Syria,” Kurdistan 24, Aug. 17, 2018. “Combined Joint Task Force Operation Inherent Resolve. Targeted Operations to Defeat ISIS,” Department of Defense website, (accessed 10/31/18). Glen Johnson, “Battered Syrian city deals with post-victory reality check,” Los Angeles Times, Feb. 2, 2015. David Remnick, “The Tragic Legacy of Raqqa Is Being Slaughtered Silently,” New Yorker, Oct. 21, 2017. For example, Ben Hubbard and Ivor Prikett, “Raqqa Was the Capital of ISIS. Can It Ever Be Home Again?” New York Times, July 11, 2018; Helene Cooper, “U.S. Strikes Killed Nearly 500 Civilians in 2017, Pentagon Says,” New York Times, June 1, 2018; “Reports: Dozens killed or wounded in east Syria airstrikes,” Washington Post, Oct. 19, 2018. Raqqa is Being Slaughtered Silently; “Thousands of Syrians stuck in the desert risk starvation,” Washington Post, Oct. 29, 2018. For a particular egregious example of this, see this interpretation of the most recent U.S. airstrike against the regime. For a few examples of this, see As’ad AbuKhalil, “The Left and the Syria Debate,” The Real News Network, Dec. 19, 2016; Branko Marcetic, “The Elite Consensus on Syria,” Jacobin, Aug. 4, 2017. Greg Shupak, “U.S. Out of Syria,” Jacobin, Apr. 18, 2019. “Kurdish-led council deepens authority across Syrian north and east,” Reuters, Sept. 6, 2018; Joost Hilterman, “The Kurds Once Again Face American Abandonment,” Atlantic, Aug. 30, 2018. “Damascus says Syrian Kurdish autonomy negotiable: report,” Reuters, Sept. 26, 2017. Yousef Khalil and Yasser Munif, “Syria and the Left,” Jacobin, Jan. 9, 2017. Nader Atassi, “Rojava and the Kurdish Political Parties in Syria,” Jadaliyya, May 3, 2014. Meredith Tax, “Socialist Foreign Policy Must Center Climate Change,” In These Times, Oct. 10, 2018. “Trump instructs military to begin planning for withdrawal from Syria,” Washington Post, Apr. 4, 2018; John Haltiwanger, “Trump now plans to keep U.S. troops in Syria until Iran gets out, which means America may never leave,” Business Insider, Sept. 24, 2018. Joost Hiltermann and Maria Fantappie, “Twilight of the Kurds,” Foreign Policy, Jan. 16, 2013. By way of comparison, Iraq’s refugee population at its peak in 2007 stood at 2 million, in a country of 26 million before the U.S. invasion of 2003. Ishaan Tharoon, “The Arab world’s wealthiest nations are doing next to nothing for Syria’s refugees,” Washington Post, Sept. 4, 2015. Jean-Pierre Goykynian, “A visit to Aleppo shows the story of Syria is still being written,” The Globe and Mail, Sept. 7, 2018. 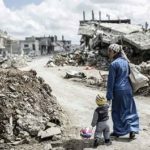 Saskia Baas, “The Real Reasons Why Syrians Return to Syria,” Refugees Deeply, Mar. 6, 2018. Immigration and Refugee Board of Canada, Dec. 2, 2015. “Q and A: Syria’s New Property Law,” Human Rights Watch, May 29, 2018. Sally Hayden, “Arrests and torture of Syrian refugees returning home reported,” Irish Times, Mar. 17, 2018.